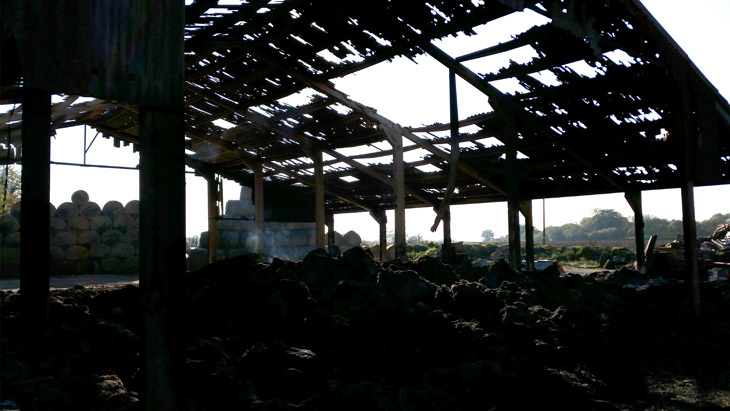 A Lincolnshire cattle farmer has benefited from Safelincs’ free after-the-fire-replacement policy after suffering a fire in one of his barns. A fire broke out at night causing extensive damage and destroying the barn before the owners were alerted and able to take any action. Some of the fire fighting equipment in the barn was also damaged in the fire. As soon as we were notified by the customer, Safelincs visited the farm and replaced two fire extinguisher exposed to the heat of the fire, ensuring that the legal obligations of the farm were met and reducing the farmer’s stress and costs in a difficult time. Safelincs, as a policy, is replacing any fire safety products purchased from it free of charge if they are used on or damaged by a fire. It is just one of many ways in which Safelincs helps its customers all the way through the life cycle of fire safety products. 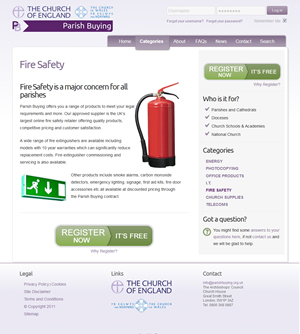 Safelincs are the contracted fire safety and H&S provider of the Church of England and the Church in Wales through their collaborative buying platform ParishBuying. We provide all fire safety products and services required in Churches, church schools, parishes, church buildings and offices as well as general H&S products such as first aid, PPE and winter safety products. Generous discounts for all Church organisations have been negotiated on top of the already competitive Safelincs internet prices. The Church of England and the Church in Wales recently asked all their members about feedback about their service providers and Safelincs came out with the highest possible rating. Customers commented that Safelincs are ‘extremely helpful’, satisfied their needs entirely and that the service was ‘excellent’. We are of course very proud about this feedback which has strengthened our philosophy of providing a personal service and best support on a nationwide scale. The findings of the survey match the findings of our independent third-party ratingprovider, Trustpilot, which confirms our ‘excellent’ rating. Safelincs’ business year ended 18% up at the end of March against the previous business year. This is the result of significant investment in additional staff and our growth in several key sectors. Increasing our teams, including our web development team in Hull, the number of extinguisher servicing engineers in the London area and the opening of a Business Development office in East London have all been big contributing factors. Becoming the chosen supplier of fire safety products and services to both the Church of England and the Catholic Church of the UK has resulted in a significant rise in our supply to this sector. Along with this we have been very active in developing our services to the Facilities Management industry. 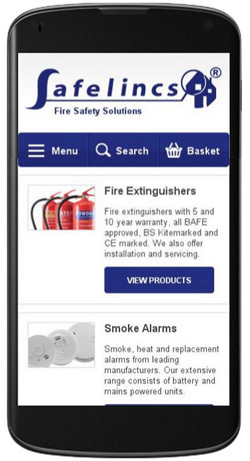 In addition to all this we have also increased our offering of fire safety products online, both through the acquisition of other fire safety businesses and through additional strategic supplier relationships. To reflect Safelincs’ increasing involvement in designing and developing fire safety products such as extinguishers and fire escape equipment, our design and development facilities in Alford were audited by BSI and added to the scope of our ISO 9001 accreditation. Safelincs is developing a number of fire escape systems for new-build residential housing and is transferring a number of products from foreign manufacture to UK based manufacturers using improved designs created by Safelincs. We are welcome contacts by inventors looking for a fire safety company as a partner to turn their ideas into reality. We are also happy to design customer specific modifications of standard fire safety products. Safelincs have been in business for over ten years, providing businesses and home owners with the best quality fire safety products and services available. We are always striving to keep at the forefront of technological developments and believe in investment in the future with already almost 40% of staff working in web and product development. As a logical continuation of this we are now opening a development office in Hull in addition to our existing development team in Alford. Hull is an ideal place for us to open the office; being a university city it provides a great base for prospective new employees. Finding new employees with the high end skills we are looking for can be a problem. Hull offers a great number of talented web developers, web designers and designers and Safelincs will now increasingly tap into this creative pool of talent. Safelincs currently works on a large number of exciting new projects, including a reporting tool for fire safety deviations and smoke alarm recognition software. Today sees the launch of our newly updated Fire Safety forum. The forum, which customers and the general public use to discuss their fire safety issues and to get answers to their fire safety questions, is now accessible from the main page of our website. The forum features fire safety categories to make searching for answers and previous discussions easier. 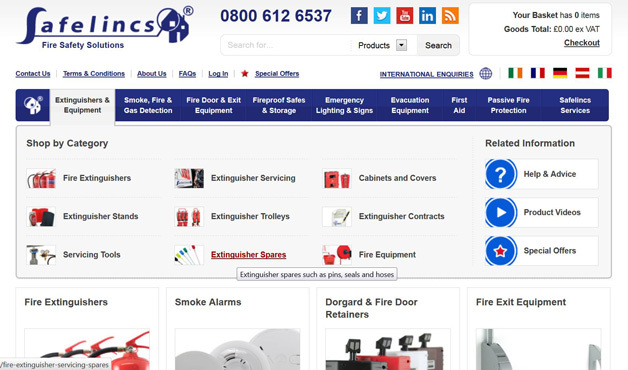 The categories range from fire safety advice, fire safety products, shipping products to product returns. The new forum makes joining much easier than our previous forum and posting comments and questions is now straight forward and easy to do. There are already some very useful posts in the fire safety products section concerning smoke alarms, fire extinguishers and fire safes. Members have posted queries about updating their interlinking smoke alarm systems and how to add different compatible alarms to their existing interlinked smoke alarm system. It is hoped that the new location will encourage more active discussions between users and will be a valuable source of information. Which fire safety products are dangerous goods in transit? A few fire safety products such as fire extinguishers and ionisation smoke alarms are classified as dangerous goods and require special handling in transit to our customers. Safelincs has three staff members formally trained as specialists for dangerous goods, being able to assess, prepare, package and declare shipments correctly to avoid the risk of interception of goods at airports, harbours and indeed the carriers’ handling centers. Having for example shipments of fire extinguishers and other pressurised items intercepted without the correct declaration and packaging could otherwise lead to fines and definitely delays. Here at Safelincs we consider all aspects of storage, packaging, declaration and transportation of dangerous goods. We have clearly identified all fire safety products in our UK Warehousing Association (UKWA) approved warehouses and have separated products classed as hazardous according to transport regulations. These products include fire extinguishers, lithium batteries, lead acid batteries, aerosols and ionisation smoke alarms. To adhere to the strict regulations outlined through ADR (road service) and IMDG (sea freight) Safelincs has produced a thorough dangerous goods procedure for each of the goods classed as hazardous, making sure that all the requirements for dangerous goods regulations are conformed to. Each product type is described on an individual basis and our trained office and warehouse staff are aware of all the classifications, which mode of transport can be used, and if Dangerous Goods Notes are required for the movement of goods. By working closely with our shipping companies and keeping up to date with dangerous goods regulations through yearly re-training we ensure the protection of our customers and all carriers/freight companies used. Posted on May 26, 2011 August 10, 2018 Author SafelincsCategories Company News, Fire Safety News, News and UpdatesTags ADR, dangerous goods, fire extinguishers, fire safety products, IMDG, ionisation alarms, lead acid batteries, lithium batteries, pressurised goods, road transport, sea transportLeave a comment on Which fire safety products are dangerous goods in transit? Follow @Safelincs on Twitter and we will donate 50p to Children in Need! It’s that time of year where it’s perfectly acceptable to bathe in a bathtub full of beans, watch your teacher get their legs waxed or see your favourite celebrity doing something dangerous on ice. BBC Children in Need reaches a climax on Friday, 19th November after a month of fundraising and campaigns around the UK. Children in Need helps to improve the lives of disadvantaged children and young people through grants, projects and campaigns. Millions of lives are affected and improved by donations raised from individuals and organisations each year, as Pudsey the bear and a host of celebrities help us try and beat the previous year’s grand total. This year Children in Need attempts to top the record breaking total of £39 million raised in 2009! Here at Safelincs we thought about getting into a bathtub of beans or having our legs waxed, but we’re far too busy saving lives with our fire safety products and services to do that, so we have instead decided that we will work with our friends to raise some money. This is where you come in! We use Twitter to keep in touch with our customers and friends around the world. Starting today, we’ll donate 50p for every new follower we get on Twitter. That’s it! So why not head over to our Twitter page and follow us right now? We are keeping track of how much money we’ve raised on our Children in Need page on our web site. Posted on November 2, 2010 September 25, 2018 Author SafelincsCategories Company News, Editorials, News and Updates, NewsletterTags Children in Need, fire safety products, raising mineyLeave a comment on Follow @Safelincs on Twitter and we will donate 50p to Children in Need! This week is the UK’s Customer Service Week and what better time could there be to announce our best customer care results ever. We ask you, our customers, what you think of us and our service through a questionnaire sent to you after your fire safety order is delivered. This feedback is invaluable to us. We use your comments to tailor our services and products to meet your requirements even better. This process is facilitated by daily feedback sessions and a weekly customer survey meeting, in which the different departments at Safelincs sit together to run through the week’s feedback. In September 83.2% of our customers that filled in our customer survey stated that they agreed ‘strongly’ with our question if they were satisfied with our service! We feel that this is a reflection of our service to our customers and that we go that extra mile to provide the best solutions for your needs. Another record was broken in September with our shipping performance. We have seen our lowest total cumulative warehouse errors at 0.2%. This is an outstanding result and beats the industry standard by far!